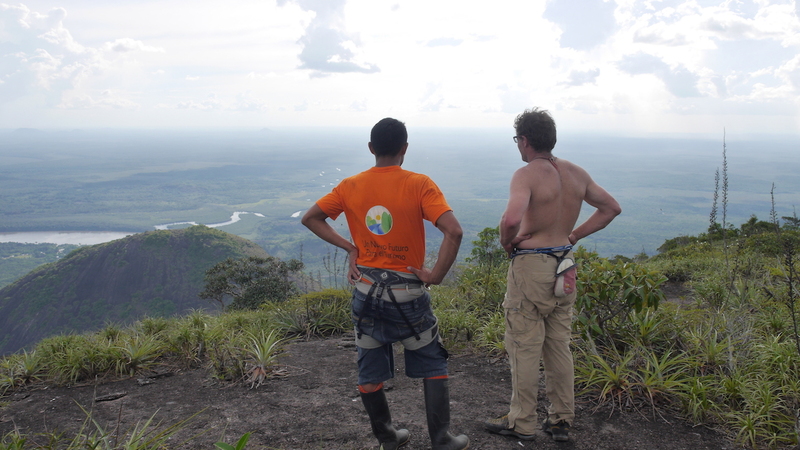 Ciro Guerra's 2015 film El Abrazo de la Serpiente (Embrace of the Serpent) inspired Canadians Kieran Brownie and Paul McSorley to visit the strange rock formations of Guainia, Colombia, that are known as the Cerros de Mavecure, part of the Guiana Shield, some of the oldest exposed rock on Earth. The four formations—Mavecure, Mono, Diablo and Pajarito—are characterized by large huecos and by runout slabs on rock that is hard and textured but offers few cracks for removable protection. In February 2017, Brownie and McSorley attempted to establish a new route on the northwest face of Cerro Pajarito by climbing ground up and onsight, using a power drill to place infrequent bolts on lead from stances, without relying on hooks to secure themselves to the rock. They established six pitches on their first attempt before they ran out of hardware and had to turn back. This year, Brownie and McSorley returned with American David Allfrey and finished the route, which they named after the film, El Abrazo de la Serpiente (V 5.11c R/X 660m). McSorley said there were "engaging runouts between protection points" and that "several pitches have an R or X rating." The runouts weren't the biggest challenge, however. "Aside from the remoteness of this area, the intense heat provided the crux," McSorley wrote in a trip report. "Climbing in the midday sun is nearly impossible on the black granite, which intensified the daytime highs reported at up to 53C [127F]. [We] began [our] days around 2 a.m. and benefited from the Super Blood Moon for added light while climbing." McSorley said that on their first attempt, he and Brownie were heartbroken to turn around because they thought the top was only a couple of pitches away. "...After finishing the route this season it was clear that we had several hundred meters left to go to reach the jungle thrash [on the] fourth-class summit slopes," he said. Even though their intended route would have to wait on that first trip, the fun was not over: "Kieran and I climbed all the other formations—Cerro Diablo (scramble) Cerro Mavecure (scramble) and Cerro Mono via a 210-meter, unprotected 5.8 line on the west face we called 'Platano Peel,'" McSorley said. "We were accompanied on this route by a villager by the name of Wilson who guided us around the area and helped me launch my paraglider from the summit. Wilson's parents gave us a boat shuttle to reach the west face and picked me up on the bank of the river where I landed." When they returned this year with Allfrey, they proceeded in the same ground-up style as before. "[We] had intended to bivy on the route [after fixing the first three pitches the previous day] but found ourselves at the proposed bivy ledge at 8:30 a.m.," McSorley said. "So we continued adding four more pitches plus the summit ridge and topped out around 12:30 p.m. The heat of the day throttled us and Kieran and I both suffered mild sunstroke. We made it back to the village just after sundown." "Having Dave along was all time," Brownie said. "The three of us really hit a rhythm on the wall." Two previous ascents of Pajarito are known to have been done—one by a German team in 1992 and one by a team of four led by Damian Benegas (from Argentina) in January/February 2015. 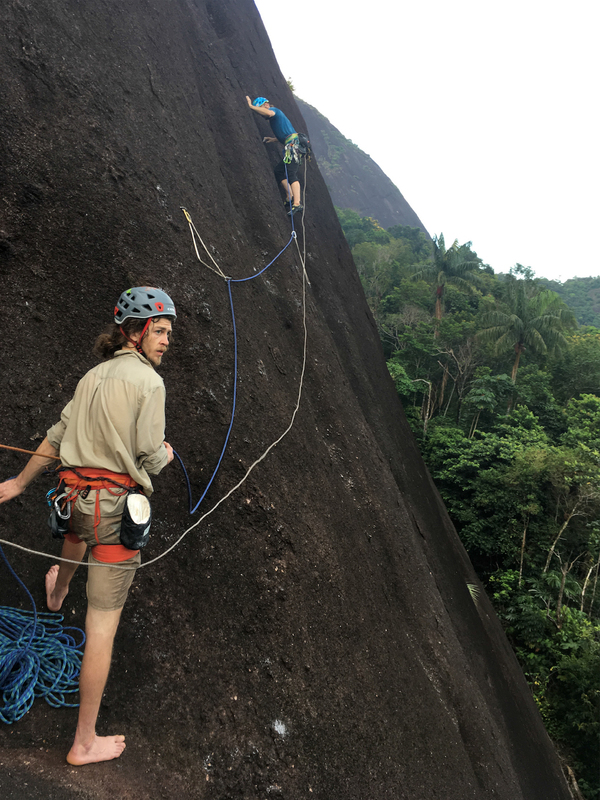 "That place is one of the highlights of my climbing career," Benegas told Alpinist recently from a spotty cell-phone connection while he was traveling in South America. The remark bears significance when you consider that Benegas has done notable ascents all over the world and operates an adventure guiding company with his twin brother, Willie. 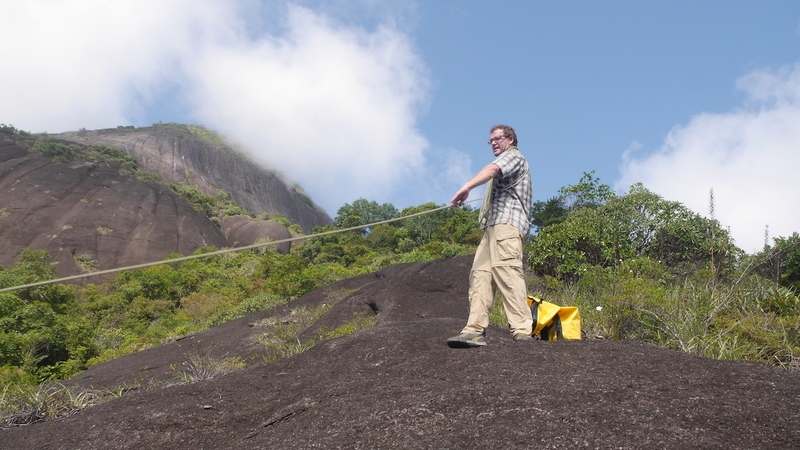 Damian confirmed that his group climbed a similar line as the Germans had years before on the east/northeast face of Parajito, but he said that they didn't see any signs of the 1992 ascent. A villager named Parmeno joined Benegas' team for a ground-up exploration. "I loaned him my harness and approach shoes, and I climbed with an improvised harness," Benegas explained in an email. "The climb was up to 5.10b, and I was not able to protect any of the eight 70-meter pitches—I was only able to reach trees for the belays. One pitch, I had to climb more than 80 meters before I reached a tree." On top, Parmeno noticed a rare fruit tree—a plant that lives on the canopy of trees that the villagers could no longer find in the sabana (grasslands). "He asked me to fix ropes so that they could reach it, but I had to tell him, 'No, we can't do that here,'" Benegas said. They got down after dark and found that local residents had been worried they wouldn't return. The climbers then put on a slide show of the summit vista for the village. Benegas said the area is just starting to see an emerging tourism industry, and he wants to encourage more visitors. He said that FARC [Revolutionary Armed Forces of Colombia] was a threat in the area at one point, then it was subjected to uncontrolled gold mining, and now tourism is bringing new hope to the remote settlements. Potential visitors should consider that of the two villages on either side of the mountains, Venado receives many more tourists than Remanso, which has caused some friction between the two communities, Benegas explained. 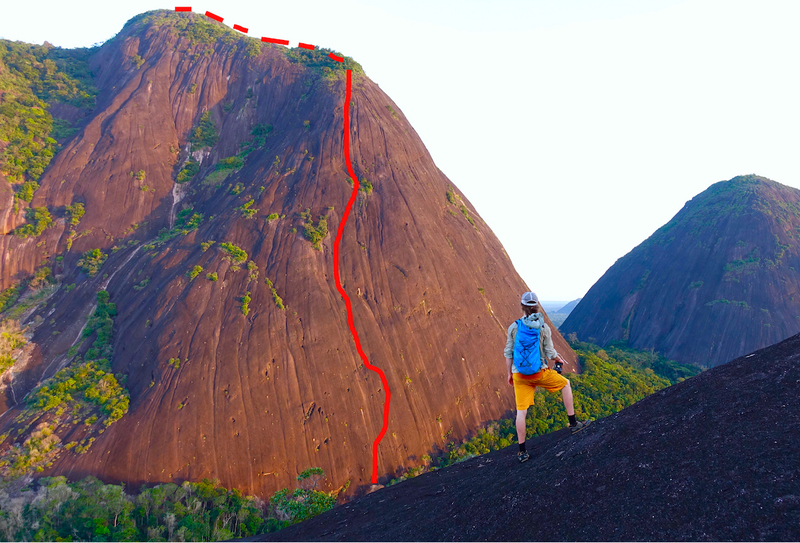 Climbers may be most interested in Remanso, anyway, as it lies at the base of Cerro Parajito. "The people in Remanso were delighted to have us there," Benegas said. "The overall experience of visiting this part of the world could be described as 'Heavy,' McSorley said. "Though we only spent four days in El Remanso, we all agreed it felt more like four weeks! The remoteness—a three-hour boat ride from the already forlorn Puerto Inirida, a border town with Venezuela—combined with the oppressive heat...made this trip feel like a big expedition."